“They say the Algonquian were the first people put on this world. Before China and Rome, there was us. The French wiped out most of the Algonquians in Canada, but many of them survived. My mother was one of them. She met my father, an American who worked for the U.S. Senate, and they had me. I never really knew him, though, and was raised by my mother on an Indian reservation in New Brunswick, Canada. “On the reservation, we lived on welfare. We didn’t have any job opportunities, and there wasn’t much to do. You know, people talk about cabin-fever. Well, living on a reservation is like having permanent cabin-fever. I just needed to leave, and that’s why I came to Washington two winters ago. I can’t really tell you why I chose Washington. I guess that I am just nosy and looking for answers. I thought Washington might have them. “We all spend our lives searching for our heritage and our history. Now, a lot of it has been modernized and put in books and on computers. Sometimes I wish that I could bring yesterday back so we could learn the real history of our ancestors. I wish that I could go back to the days of hunting buffalo and living in a teepee. Those were days of purity and beauty and I am searching for ways to live that way again. While I search for that, I have had to learn how to take care of myself on the streets. 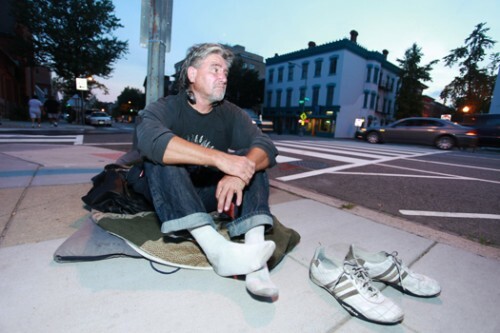 “When I first moved to Washington, I lived at the shelter on 14th and R St. I didn’t like it there because it was too claustrophobic. I decided that it was better to live out on the street, so I moved to other side of 14th Street and lived on the corner. The dope addicts there used to punch me while I was sleeping and steal my stuff, so I moved to the corner of 14th and Corcoran. It’s been quieter here and they don’t bother me no more. “Now, I stay here and have learned how to wash my clothes at night with water from people’s hoses. I learned how to create a private space to change my clothes while I am in my sleeping bag. I found people who let me use their bathroom and give me coffee. I really don’t ask for or need a lot. I’m always wet and damp out here, but I never complain. I feel guilty because I should provide for myself. That is part of my heritage. While Michael doesn’t like to ask for help, he appreciates fresh fruit, especially oranges and apples. If you walk past him on the NE corner of 14th and Corcoran, please consider stopping by to say hello and bringing him some fruit.